You are here: Home » You say Skewers… I say Alambres! Brochetas or Alambres are our Mexican beef kebabs; they are made with a few ingredients that include onion, green pepper, bacon, and beef. They are really easy to prepare and we love to grill them on our small cast iron Hibachi grill. But if you have a gas grill the results are still delicious. I sometimes prepare them indoors in my stove top cast iron grill. I live in an apartment and grilling outdoors is one of the things that we miss the most. In Mexico, like in many countries, we love to grill our “carnes asadas” (grilled meats) using charcoal. And, even though we like to grill different cuts of meat, for this recipe is better to use a tender cut like beef tenderloin or rib eye since, these are some of the finest cuts of meat from the cow that render softer, juicier and flavorful steaks. We love to eat them with flour tortillas and with side dishes like guacamole, grilled nopales, and a spicy salsa. Preheat the grill to medium-high and lightly oil the grates. Thread the meat and vegetables onto the skewers, following this pattern: Start first with the onion, then green pepper, bacon, meat, red pepper, and onion. Place beef skewers on the grill and cook until browned. Remove from grill, cover with aluminum foil and let it rest. Serve with warm tortillas, a spicy salsa, and guacamole. Brochetas or Alambres are our Mexican beef kebabs; they are made with a few ingredients that include onion, green pepper, bacon, and beef. They are really easy to prepare and we love to grill them on our small cast iron Hibachi grill. But if you have a gas grill the results are still delicious. 1 green pepper cut into 1-inch cubes. 3 thick slices of bacon cut in 1-inch pieces. 1 red pepper cut into 1-inch cubes. Place meat in a medium size bowl, season with salt and pepper and toss with the vegetable oil. Now thread the meat and vegetables onto the skewers, following this pattern: Start first with the onion, then green pepper, bacon, meat, red pepper, and onion. Repeat until all the meat has been placed onto the skewers. Place beef skewers on the grill and cook until browned. At least 3 minutes per side. Remove from grill, cover with aluminum foil and let it rest for about 5 minutes before serving. • If you use the wooden skewers, make sure to soak them in water for at least half an hour to prevent burning the edges or just cover the edges with aluminum foil. How do you like to marinate your grilled meats? I am going to try grilling this today! They look so good. I will let you know how they come out. I tried it and I liked it!!!! Hi Mely! I love reading your recipes and adventures in Mexico. I have also made some of them, although I can't remember which ones right now. 🙁 does the word asada mean grilled? It's difficult to know what to order in Mexico when you don't know what the words mean, so we tend to stick with familiar foods. We did have tacos arrachera a while ago in Merida, and also in Chetumal. Both places had very good food and the arrachera was so soft. 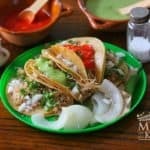 Can you tell me what cut of meat the arrachera typically would be? I'd like to try it at home but don't know what meat to buy for that. Arrachera is what you will find as "Fajitas".